I’ve heard of a fellow recumbent triker who has Parkinson’s. Like me, he believes that life should be fun and full of adventure. Also like me, he believes in doing whatever it takes to make that happen. No matter what your degree of health, your body’s level of ability or disability. This guy has a goal of raising awareness about Parkinson‘s and educating as many people as he can. He wants to help raise funds for research. He’s on a mission to gather up as many passionate souls as possible to join him in his goal to find a cure for Parkinson’s. How’s he doing that? Well, on a trike, of course! And the means by which he hopes to reach even more people than his traveling and trike rides can take him, is film. 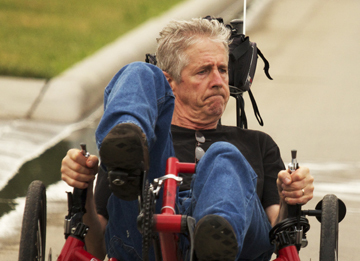 A documentary about Larry Smith and his three-wheeled advocacy tour. He needs our help to make this happen, and my hope is that you’ll all join me in supporting him and his mission. Larry’s film is important to me, personally. Not just because he’s a fellow trike rider whose life-with-Parkinson’s has been transformed by the glory of cycling, but also because my grandfather, Parker Blankenship, also had Parkinson’s. And because my Grampa Parker, like Larry, was a fighter. Someone who vowed to make every bit of life the he had left as rich and active and beautiful and meaningful as it could possibly be. I’ve written on this blog many times what an inspiration Michael J Fox has been to me. What Larry Smith’s story has made me realize is how much my Grampa and Michael J Fox have in common. (How did I not connect these dots before?) Like my grandfather, Michael J Fox and Larry Smith demonstrate a spirit that burns brightly in the face of a deluge. An onslought that just keeps blowing and pouring down, getting stronger as time goes on. These men are the kind of warriors who can stand in the middle of a storm and radiate warmth, light, calm. On many occasions, they manage to surpass that by generating celebration, passion, a kind of fierce and focused determination that doesn’t just change things or transcend circumstances, it changes people. So, I’d absolutely love it if you’d take the time to read Larry’s story. Just follow the links below to check out his advocacy rides on his recumbent trike and the plans for this exciting documentary. If you’re so inclined and able, join me in supporting a worthy mission, a film that could be the agent of information & education, encouragement & inspiration & change for so very many people. And let’s not forgot the true goal, the end-game: A CURE. Larry Smith, if you’re reading this – I want to come ride with you, someday! And if y’all are in a super-philanthropy mood . . . I am stanislao Lucheschi from Milan, Italy. I was surfing on the web trying to understand whether it was possibile for my brother to’ partecipate to’ the NY Marathon with a trike recumbant. I found your fantastic story! I will be’ very grateful if you could help me in understanding what we have to’ do and which documenta we have to’ provide. My brother is 37 and he too has a trice trike. It would be’ fantastic to’ partecipate to’ the NY Marathon 2011 together!! That would be pretty awesome to do the marathon together. I’d love nothing more than a fleet of recumbent trikers to show up from all over the globe to ride the NYC Marathon! Challenged athletes should contact Achilles International and become a member. They are a phenomenal organization which helps people with all types of disabilties to participate in mainstream athletic events. I would never have made it to the New York City Marathon without their stellar advice and rousing encouragement. Achilles has a team – a community, at its essence – in the NYC and other marathons/events throughout the year, all over the place. Another way to gain entry to an event as a challenged athlete requesting the use of a recumbent trike for accommodation of a disability is to contact the marathon/event director yourself. But we should visit before you do that, since it’s a tricky situation, and there are many things that come into play. Is your brother already participating in events/marathons where you live? I’d love to hear about that!